I’m curious what would happen to one if they ate an entire container of feta spread out of their refrigerator with a spoon. Last year when I was doing the book tour and promo things for Seriously Delish, everyone always asked me what my favorite recipe was in the book. Of course, right? That’s a normal question. And most people would have a normal answer, unless you’re an anxious millennial who says EVERYTHING is your favorite every day of the week and pretty much loves everything unless you absolutely hate it. On/off switch. amirite? I cycled through nearly 400 recipes when developing my favorites for the book. And I can still pick favorites, like the grilled cheese with a potato soup dipper, the chicken panzanella, the peanut butter brownies, the coffee and donuts ice cream, the flank steak with sriracha cream, the pistachio cream cake. Easy favorites, right? Just don’t ask me tomorrow. But no. I pick… a boring favorite. It just appears boring. But it is the ULTIMATE favorite. I call it the ultimate favorite because it’s probably the recipe I’ve made most out of my book. 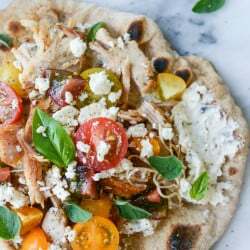 The chicken pitas with whipped feta were my answer to that question almost every time and usually – they still are. I was making it weekly before I even wrote the book. And by the way, I totally stole the recipe from my cousin Lacy who made it on a whim one night and served it to me and I was like THIS IS THE BEST THING I’VE EVER TASTED! before promptly begging her to let me include it in the book. The texture is ideal because the pita is fluffy and warm. The feta spread is creamy and cold. The chicken is warm, then the tomatoes and herbs and feta crumbles are cool again and add some chew. I highly recommend adding some hummus as well. In the book, I also include a quick tzatziki. How much can we trash our pita up?! thismuch. GAH. I love it so much. For a few years we ate this with the chicken, feta, tomatoes, maybe some lettuce and hummus filled inside the pita pockets. I like that – it’s convenient and cute. But I am really into this open-faced pita flatbread thing even more. It’s sort of like a pizza but not. You can just keep piling things on top, whereas filling a pita isn’t as easy because it gets stuffed to the brim and eventually no longer fits in your mouth. Annnnnnnd. You know how all summer long I’ve been whining about how obsessed we are with fajitas? Well. These are the old fajitas. This is that one recipe you find that you HAVE to make weekly because you crave it and it’s simple. You don’t even have to make your own pita and many times, I find excellent whole wheat ones at my grocery store and they are super puffy and fluffy. Like clouds. Clouds for dinner. It’s now a thing. Add the chicken to a large baking dish or resealable plastic bag. Whisk together the olive oil, lemon zest and juice, garlic, vinegar, dill, salt, pepper, paprika and cumin. Pour it over the chicken and toss it to coat. Place the dish or bag in the refrigerator and marinate for at least 2 hours or overnight. When ready to eat, remove the chicken from the fridge. Heat your grill on the highest setting (I believe ours goes to 750 or 800 degrees F) and grill the chicken until brown on both sides and cooked through, about 5 minutes per side. Remove and let cool slightly before shredding. To serve, slather a pita (open-faced) with the feta spread. Top it with the chicken (preferably still warm) and cover in a bunch of herbs, tomatoes and extra feta on top. Devour. Place the yogurt in a large bowl and add the feta. Crumble it up with a spoon and stir. Add in the garlic, olive oil, herbs, salt and pepper and mix until combined and creamy, breaking down the feta crumbled as you go. I like the make this ahead of time so the flavors really come together. Combine the water, yeast and honey in a bowl, stirring once to mix. Let it sit until foamy, about 10 minutes, then stir in the flour and salt. Stir until the dough comes together then use your hands to further bring it together – if it is super sticky, add a bit more flour (I usually add extra all-purpose when needed). Place the dough on a floured surface and knead it with your hands for above 5 minutes. I have kneaded it for a shorter amount of time and it’s been fine. Rub oil along the inside of a bowl and place the dough inside, then cover it and set it in a warm place so it can rise. Let it rise until doubled in size, about 1 1/2 hours. Place the dough back on the floured surface and knead a few times. If it’s still sticky, add a few sprinkles of flour with your hands and knead until it’s silky smooth. Cut the dough into 8 equal pieces. Roll each piece out as thinly as you can – we are talking super THIN. Heat a cast iron skillet over medium-high heat. Brush with a bit of canola (or another higher heat) oil. Place the thin dough round on the skillet and cook for 30 seconds, just until it starts to bubble. Flip it over and cook for 1 to 2 minutes, it should get puffy and have a few golden spots. Flip over and cook for another minute. Set aside and repeat. Speaking of clouds, look at that pita! I see a reverse chicken emoji head. What do you see? I wanted to comment and say that the marinade sounds great…and then I wanted to say that the feta spread sounds great…and so does the pita…so, I guess I should just make it! I can see why this is one of your go to recipes! Looks fantastic! I’ve made quite a few of the recipes from the book and the chicken pitas really might be my favorite too! My boyfriend is obsessed with them and keeps asking me to make them again. This looks so delicious. I’ve never made homemade pita bread. Thanks for inspiring me! This made my mouth water. Your recipes are unbelievably creative! *insert heart-eye emoji here* and YES to all the millennial troubles; different favorites every day. Don’t make me choose. This flatbread makes me want to throw a party so everyone can eat it because it looks THAT delicious. Ahhh! I love those chicken pitas with the spicy feta spread!!! Can’t wait to make this version! I think if someone asked me my favorite recipe of the ones I’ve written, I’d never be able to choose. Sometimes it’s hard for me to pick what my favorite thing to make is, but it makes sense that my favorite just might be the one I gravitate to — the one I make the most. That’s a great way to think about it! Love this flatbread. I want this in my belly now! 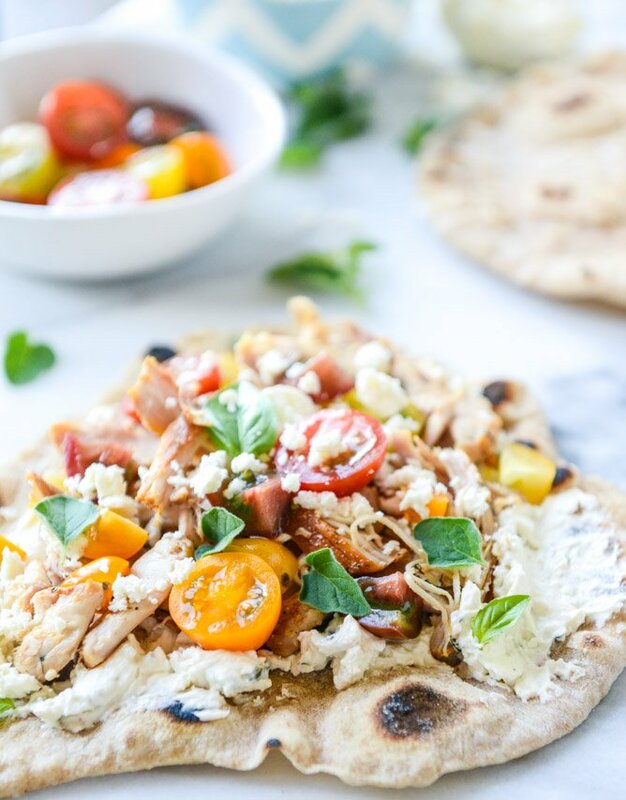 I made your creamy whipped feta by the way and it was amazing, now I have to try it on this flat bread! Haha this is hilarious! To answer your serious question, gas. Lots. And I want in on this clouds for dinner thing. That’s my favorite recipe in the entire cook book. We eat it all. the. time. Can’t stop won’t stop. I love feta and I love this dish! Flatbread’s are totally my jam right now with it being 90+ degrees in So Cal! Blegh! The combo of the creamy feat and smoked chicken sounds to die for! OMG LOOK AT THOSE COLOURS!!! Even though it’s still Winter in Australia, I am so making this next week. OMG! This is insane! I’m new to your blog and have become obsessed with it. In the last few days I have made your Tropical Banana Rum and Melon Breakfast Bowls, Marinated Zucchini feta salad with toasted pistachio breadcrumbs and that lead me to your My Favorite Greek Salad with homemade whole wheat pita. That dressing is to die for like how did I ever lived without it?! I actually drank some of it in a shot glass cold off the fridge and it was oh soo good and I am not ashamed of it. It can be used as a marinate for ceviche and many other things. The thing is that I couldn’t do the homemade pitas as I didn’t have the time, but then it bother me and I started fantasizing about making the whole wheat pitas and then I am thinking, ok I can put hummus on top of the pita and tomatoes, cucumbers, olives and chopped dill and feta and omg grilled chicken, we need to grill!! So I go to your website to open the whole wheat pita recipe and taaddaa!! this recipe is here!. My dreams, fantasies and latest obsession materialized in front of my eyes. How did you do that!!?? This is happening tonight!! with frozen watermelon papaya rum drinks. Thank you!! Fan for life! This looks delicious and easy to make for dinner, the ingredients will be on my shopping list for next week. Have you ever used ricotta instead of feta? OMG! Made the cookbook version of this last night and it was outstanding. The husband said 3x that it was the best meal ever. And we added these homemade pitas which did not disappoint! <3 your recipes. This was so yummy, grilled chicken was awesome! Ahhh this looks so delicious! FYI – your written instructions for the marinade do not include the honey. I saw honey on the list so I added it in with the other marinade ingredients, but some might miss this if they are following along the written instructions. Looks delicious, but some of the directions are confusing. I added the flour that was listed in the ingredients list for the pitas and it was way too much. Is it really supposed to be 1 1/2 cups whole wheat and 1 cup all purpose? Take pleasure in the good thing about the 24/7 game playing and support that is available as of this gaming website. The roulette wheel presents the high-class casino gaming. Recognize for this online gambling site to casino game titles. Acquire amazed to find a variety of online casino video games that provides you exciting real money. So start fantastic stop play. Delight in the thrill of the extremely popular casino games like live roulette, baccarat and black jack and so forth Become a member of the gaming community right here and get attractive bonus. Thanks a lot for providing the great technology is visible in this blog and using the great technology is visible in this blog. I am really like the great technology is visible the great services in this blog. This is very much enjoyed for the great info is visible in this blog and using the great technology is visible in this blog. Thanks a lot for providing the great info is visible in this blog. I was searching the great services in this blog and using the great technology in this blog. I just wanted to say, I came across this recipe the other day and made the creamy feta and homemade pitas yesterday. LIFE ALTERING. This recipe is a gift to the world and I wish everyone knew about it. Thank you for sharing!